Just when you think the run may end, the Denver Nuggets keep on rolling. With Denver’s 115-107 victory over the Boston Celtics, they are now 9-1 and off to their best start since the 1976-77. The victory moves the Nuggets to 6-0 at home this season, and keeps them into second place in the Western Conference. There is certainly a lot to unpack in this one, so let’s dive into tonight’s five takeaways. In a season full of storylines, none may be bigger than the game Murray had on Monday night. Murray’s 48 points were a career-high. Murray split his output between 23 points in the first half and 25 points in the second half. His 19 fourth-quarter points carried the Nuggets to victory in a game they trailed by as many as 18 points in the first half. You could tell Murray was feeling it out of the gate, as he had 14 of Denver’s first 16 points to start the game and was scoring in all types of ways. He was hitting contested layups, three-pointers, or just a wicked step-back jumpers for good measure. Murray was not just scoring at will though, as he also did it with extreme effectiveness. His 48 points came on 19-30 shooting and 5-11 from behind the three-point line. Murray also went 5-5 from the free-throw line to go along with five rebounds and four assists. Attempting to score 50 points, Murray put up a three at the buzzer attempting to hit half a hundred points for the night, but the shot rimmed off the front iron. Still, Murray had one of the greatest nights in Nuggets’ franchise history, and it is a big reason as to why Denver is now sitting atop the Western Conference standings — even if it did bother a few of the Celtics players. On a night where he hauled in 10 rebounds and dished out eight assists, Jokic attempted just three shots all night. He went 2-3 shooting from the field for eight points, but those three shots are the worrisome stat for him. At times, Jokic can become passive and not look for his shot. That issue returned Monday night. It is hard too look for your shot when you have a teammate as hot as Murray, but Jokic was definitely rattled by Al Horford’s defense. In the first half, Jokic attempted just one field goal and had only four points. Even if he was not looking for his shot, Jokic still affected the game in other ways and was a key piece in Murray’s huge night offensively. Through 10 games, Jokic is now averaging 7.7 assists per game, which is four points higher than the next closest Nuggets player (Monte Morris at 3.5). He also leads Denver in rebounding with 10 per game and comes in as third on the team with 17 points per game. Those are crazy numbers for the Nuggets big man, who is just 2.3 assists shy of averaging a triple-double. Even when he is not looking for his shot — like against the Celtics — Jokic still finds ways to make an impact and that’s huge for a team that is looking for solid play from their franchise player night in and night out. It should not come as a surprise anymore, but the Nuggets second unit put in another good showing against the Celtics. With 38 bench points, the Nuggets reserves outscored Boston by 10 points and were a huge reason as to why Denver was down by just two points at halftime. In the first half, when Denver trailed by as many as 18 points, the Nuggets bench unit came into the second quarter facing a 34-19 deficit. The second unit cranked up the intensity though, led by Trey Lyles who was finally able to get going offensively. Lyles finished the night with 13 points in 23 minutes and shot an effective 4-10 off the bench, 3-7 from behind the three-point line. With his solid performance, Lyles is now averaging 10 points per game and is up 17.6 percent shooting from behind the arc. Certainly not a great number, but is no doubt a step in the right direction for a player looking to find his rhythm offensively. It was not just Lyles though as Monte Morris, Juancho Hernangomez, Malik Beasley, and Mason Plumlee all played key roles in the Nuggets victory. 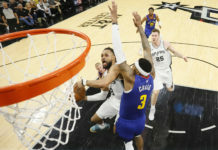 Whether it was a key defensive stop or a key three-pointer, the Nuggets bench unit made their stamp on this game and continue to prove how vital they are going to be for this Nuggets team moving forward. If you watched the Nuggets performance in the first quarter, there was a strong possibly you probably changed the channel. 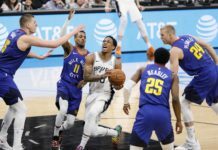 The Nuggets were outscored 34-19 in the first and the only thing they could hang their hat on was the solid play from Murray, who had nearly 75 percent of the teams points at the time. 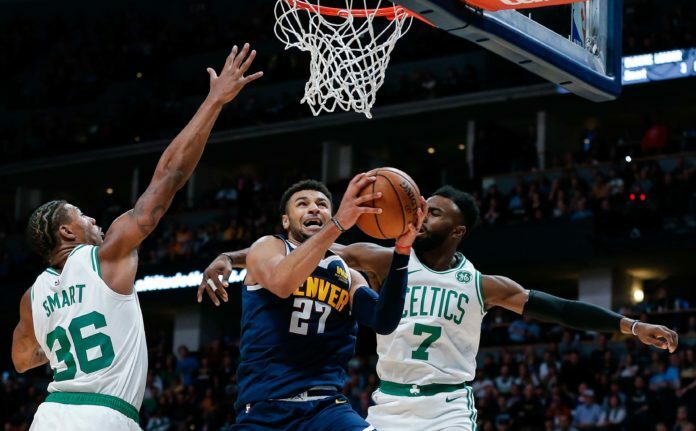 If you stuck around though, you saw an incredible display of basketball for three straight quarters as the Nuggets went on a team outscoring Boston 96-73 the rest of the night. The offense picked up its sense of urgency and so did the defense, which is why the Nuggets walked away victorious and Boston left empty handed. The combination of solid defense with timely offense was the key for success yet again against the Celtics. The recipe all season has been defense, defense, and offense when they have it going. 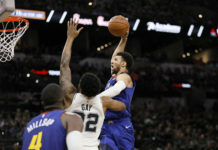 Monday night was no different, as defense came to play when it mattered most and Murray carried the weight offensively. There is no doubt about it that this Nuggets team has proven they are for real through ten games. If we have learned anything through 10 games though, it is that you probably should not bet against this version of the Nuggets. Even when they are down, they will not go away. Denver has shown fight all season and a will to win that this franchise has desperately been searching for during the past five seasons. Monday’s performance against the Celtics just helped that narrative even more. After Torrey Craig played the first two minutes of the game, Nuggets head coach Michael Malone was quick to insert Hernangomez off the bench. Juancho would not disappoint as he finished the night with eight points on 3-6 shooting from the field, with two of those coming from behind the three-point line. Hernangomez drained that three after the incredible pass from Murray, who Juancho praised after the game for his performance. It was not just Murray who had a good night, as Hernangomez continues to prove his worth to this team on a nightly basis. With Craig playing just two minutes tonight, there is no doubt we could see a potential change in the starting lineup moving forward, and Hernangomez seems like a prime candidate to fill it.